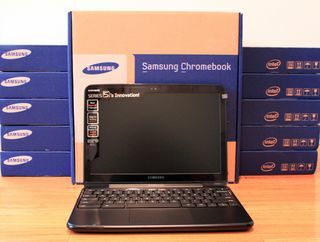 Thanks to Google, we're giving away 12 Samsung Chromebook Series 5 laptops at the Streaming Media East show, taking place May 15-16th in NYC. To attend the Google keynote on May 15th, simply register online for a free exhibits pass and you are in. After the keynote, attendees will have the chance to win one of these laptops. An extra special thanks to Google for being so generous with the giveaways!